This is one of my favorite to have with rice and curd. Cut beans into small pieces. 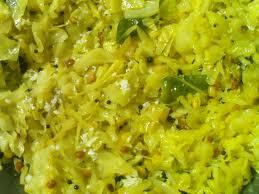 Mix cabbage and beans with shallots and Turmeric and keep aside. Heat Oil + mustard seeds + cumin seeds + curry leaves + Red Chilly + Cabbage Beans mixture + salt + chili powder. Finally add grated coconut, give a quick stir and switch off. Where’s that lovely yellow colour from?